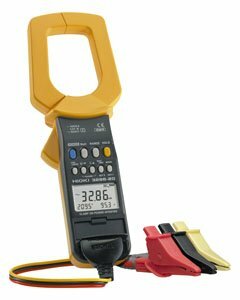 Hioki clamp meters are best in class handheld current and voltage meters for safely and accurately measuring power lines. The 3286-20 can measure voltage, current, power, power factor, phase angle, reactive power or frequency, as well as detect phase sequence on live lines at any desired point of a single-phase circuit or three-phase circuit. Note: The 3286-20's three-phase power measurement method calculates and displays the power values for a sine wave input at 50/60 Hz, assuming it is balanced and there is no distortion. Accurate measurement is not possible on a three-phase line if it is not balanced, for example when controlled by an inverter or thyristor. Since there is no integration function, it is not possible to measure total energy consumed (Wh).